"As long as I'm with you, you shouldn't worry about a thing." 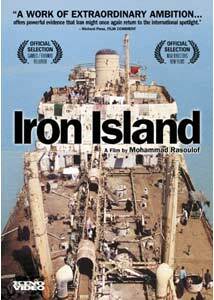 There's a blurb on the backcover of this DVD from the Christian Science Monitor, calling Iron Island one of "the best movies to come out of Iran in years", which depending on your mindset might be damning with faint praise, or actually be genuine adoration. That all hinges on your taste in foreign films, and considering my depth of knowledge on Iranian cinema could fill a thimble I had no far-reaching preconceptions either way going into this one. Writer/director Mohammad Rasoulof paints with broad strokes of allegorical aplomb in the story of a dilapidated, rusted out oil tanker anchored off the Persian coastline, in which a grizzled and wise captain (Ali Nassirian) acts as de facto ruler to a teeming mass of disenfranchised and disowned Sunni-Arabs who live on the ship. Nasirian's Captain Nemat has to deal with a whole host of struggles—not only might it be sold for scrap, but it appears to be sinking—including discovering dangerous newfound limits to his leadership abilities. As the title suggests, the ship itself represents more than just a ship, and its place as a sort of floating exile nation is where all the arty bits come together for Rasoulof. The narrative itself is rather liquid, and probably far less linear than a typical Western film, with events often unfolding ever so slowly. Nassirian does an admirable job serving as the story glue and wearing many different hats, linking and connecting assorted characters as Rasoulof depicts the rusted ugliness of the tanker as a not-so-thinly veiled reference to real societal woes, specifically inherent in the Iran culture. Unlike The Christian Science Monitor, I'm not really in a position to laud Rasoulof's Iron Island as one of "the best movies to come out of Iran in years", though from my perspective it works as a visually rich microcosm that inches along what at times seems like an alien landscape, sometimes too slowly for its own good. There is a documentary feel in much of the way Rasoulof allows the camera to tell the story, and Nassirian—as the floating benefactor, protector, king—carries the weight of the world on his shoulders quite well. Image Transfer Review: Kino has issued Mohammad Rasoulof's film in 1.85:1 anamorphic widescreen, and despite being a fairly recent project, the transfer carries some very washed out colors and quite a bit of grain. The result is something that looks far older than it is, and not in a good way. All in all, a noticeably weak transfer. Audio Transfer Review: The original Persian language audio track is presented in a rather spartan 2.0 stereo mix. No evidence of distortion or clipping, and voice quality fell within fair and acceptable limits, without any bursts of auditory dramatics. Extras Review: Extras are on the lean side, and consist of the film's theatrical trailer and a brief stills gallery. The disc itself is cut into 12 chapters, with optional English subtitles. Mohammad Rasoulof's allegory of Muslim-hued survival straddles that serious arthouse line in a well-received film that has lots of bleak visual beauty but moves rather slowly to make its point.